1. Whisk lemon zest, lemon juice, oil and salt in a large bowl. Add watercress, egg and corn; toss to combine. 2. 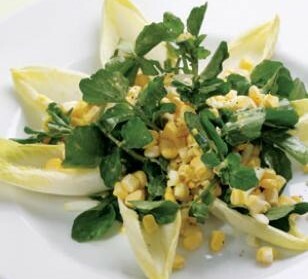 To serve, arrange about 6 endive leaves on each salad plate in the shape of a star and top with about 1 cup of the salad. Season with pepper.